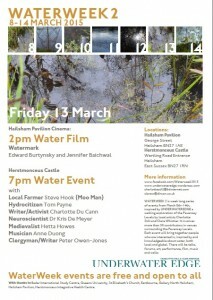 Xaverine Bates explores more of the themes in Clare Whistler’s and Charlotte Still’s WaterWeek 2: a week of events which meanders, dips and plunges into an array of water in its many forms from a myriad of perspectives. Charlotte Still and Clare Whistler were at artist Len Shelley’s funeral a few years ago and particularly remembered a childhood friend of Len’s saying that they used to meet up once a year and walk from the mouth to the source of a river. It struck them both as a special way to keep a friendship alive whilst simultaneously focusing on water and landscape. Thus their first project STREAM started as they ambitiously began looking for all the sources of the River Cuckmere. After a few months they started to concentrate on about a mile’s circumference around Foul Mile near Cowbeech, finding every stream and finding a way back to its source. They collected material: writing, photographs, film, for about 18 months and were then offered an empty shop as a studio in Hailsham. 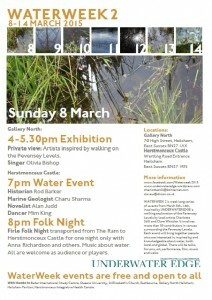 On realising that they had come up with more questions about water the more they worked with it, they decided to create a free event as their artwork, where experts shared their passion for water. And so WATERWEEK found its source. One of the speakers, Graham Kean, the drainage expert for Wealden, piqued their interest about the fact that Hailsham had been a port years ago. This led them to a new project UNDERWATEREDGE, walking the edge of the Pevensey Levels; they fortunately secured a residency at Herstmonceux Castle to do this. This year, WATERWEEK 2 is a scintillating way to share more water words from all sorts of people from an array of disciplines. As the project is unfunded, it is also about a generosity from everyone that allows everything to flow. 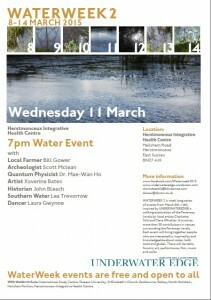 Speakers during the week include marine geologists, archaeologists, artists, dancers, novelists, farmers, neuroscientists and many more, all examining water in its myriad forms and formations across countless fields. Marine geologist Charu Sharma will be discussing challenges and change in river management: from control to conservation, and back again, or as she phrases it, “Microfossil indicators of shoreline changes in a spoonful of mud!” Charu Sharma has had a microscopically close relationship with the fossil remains of unicellular micro-organisms called foraminifera for many years. She started by grinding them up for chemical studies on Arabian Sea sediments in India, moving on to identifying them at the species level for palaeoceanographic and sea-level studies for her doctoral research. They also allowed her to travel to various parts of the world including Down Under, North America and the UK, as well as working in a medieval castle. 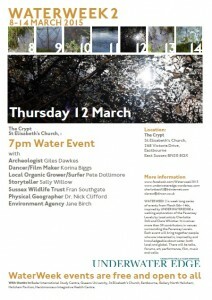 Physical geographer Dr Nick Clifford will be exploring Water and the Brain in his talk. Dr Clifford is professor of physical geography and head of department at King’s College,London. Educated at Cambridge University, he has held appointments at Hull, University College London and Nottingham. He is a river scientist who has worked internationally with the UK research councils on freshwater resource issues, and with the British Council on global innovation, water and agriculture. 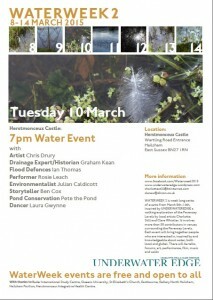 He is currently a director of the UK River Restoration Centre, hosted at Cranfield University, and a trustee of the Papplewick Water Education Trust in Nottingham. Neuroscientist Dr Kris De Meyer is a research fellow at King’s College London, researching how information from multiple senses is integrated in the brain. He co-produced Right Between Your Ears, a documentary about how we become convinced of what we believe, and is writing a book about how we judge people we disagree with. Jo Seaman is an archaeologist and heritage professional employed by Eastbourne Borough Council as heritage service manager. He has been in the business for over 20 years, having previously held a variety of posts with English Heritage, the National Trust, East Sussex Archaeology and Museums Partnership and done a stint as a freelancer. Archeologist Giles Dawkes has been undertaking archaeological fieldwork for 22 years, mostly in the UK but also in the USA, Australia and Kazakhstan, and is currently a senior archaeologist at Archaeology South-East, University College London. The Pocock’s Field excavation revealed the evolution of a ‘marsh-side’ landscape from the bronze age to the Tudor period. The novelist Alan Judd will also be speaking during the week. Alan Judd is a local author of two biographies and 10 novels, two of which were filmed by the BBC. He has contributed to a wide range of national newspapers and is currently motoring correspondent for The Oldie. In her talk, ‘The Aqueous Female’, artist Xaverine Bates will be exploring themes used by female artists through the medium of water. 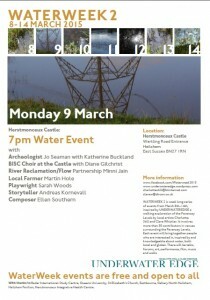 She will delve into such topics as a body of water – saliva, urine, amniotic fluid and bathing​ – through the work of Francesca Woodman, Frida Kahlo and Helen Chadwick; political waters and ripples of discontent expressed by Tamsyn Challenger​, and Mona Hatoum​; sodden domesticity examined by Mierle Laderman Ukeles and Mary Kelly​; and aqueous ecology – sea, river, snow, rain, floods, drought, ice – in the work of Anya Gallacio, Ana Mendieta and Nastasia Alberti. The Fluid Self, an audio walking experience by Korina Biggs, invites you to participate in this audio-based walking and moving experience in the outdoors, connecting the fluid nature of ourselves to the fluidity of the environment. After a degree in sociology, Korina became a founder member of Frantic Assembly. She trained as an Alexander technique teacher and teaches privately and in a variety of performing arts institutions. She has an MA in dance and somatic well-being and belongs to Dancers in Landscape and‘The Knowing Body Network, and more can be seen of her work on her website. 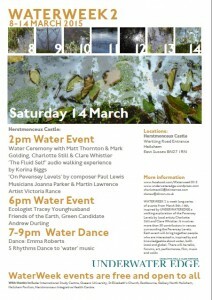 For more information about times and venues, see WaterWeek 2015.